Art surrounds us everyday, it's in advertisements, commercials, movie trailers, etc., one form of art or another has been a part of my entire life. I was drawn to the arts that schooling introduced to me... drawing, pottery, metalwork, woodwork and many other mediums. In college at Central Michigan University, I expanded my knowledge of digital animation, graphic design, art history and color theory. I had the chance to work in the sculpture shop while there, creating works out of metal, ceramics and wood. It was also at CMU where I met a professor named Shelley Stevens in 2007. While in one of her drawing courses, she suggested I enroll in one of her painting classes. I haven't stopped painting since! 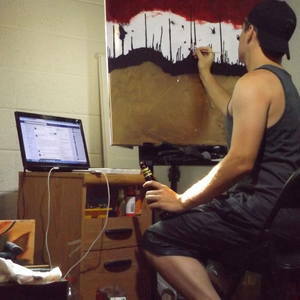 Working out my studio in Royal Oak, MI I have been honing in on the specific style I enjoy. Dealing mostly with colors and abstract images, my paintings have left varying interpretations with viewers. Enjoy! !